Randy Owens, of Ocala, has struggled with his failing kidneys for more than 18 years, enduring countless trips to an outpatient dialysis center that often left him exhausted and depressed. He’s now administering his own peritoneal dialysis in his own home. Consider the common perception of renal dialysis. It is administered in a hospital or a center by doctors or nurses with years of experience, using a complicated piece of technology that is both lifesaving and intimidating. So, after Randy Owens struggled for years with his failing kidneys, after the months in the hospital over the course of 18 years and the countless trips to an outpatient dialysis center that often left him exhausted and depressed, the Ocala man found himself ready to try something his instincts told him was madness. Owens would administer dialysis to himself in a spare room of his house. Owens is one of hundreds of people with kidney disease who have participated in an innovative University of Florida Health program, started in 2012, that takes the mystery out of kidney disease and home dialysis. The Chronic Kidney Disease Education Clinic at UF Health, one of the few programs like it nationwide, empowers patients, under a physician’s supervision, to take charge of their dialysis, reducing costs and allowing them to lead better, more independent lives. The clinic’s aim is to help reverse a vexing trend in dialysis care. Of the 500,000 Americans with end-stage kidney failure, an overwhelming 90 percent get their dialysis in-center or at a hospital. That means just 50,000 choose home dialysis, an option that is less expensive, often more convenient and just as safe. Fear is overcome by its best antidote: knowledge. 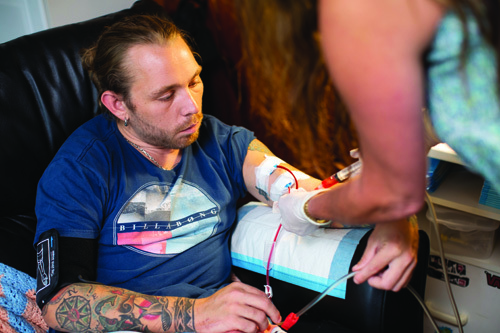 The program allows patients to safely administer dialysis to themselves in the comfort of home, freeing them from the four-hour-long, thrice weekly sessions in outpatient dialysis centers, often for-profit facilities that can be far from home. For many, home dialysis lets them keep their jobs and reclaim lives that have been interrupted by kidney disease, program officials said. This kidney disease education concept — it is unclear where it originated — isn’t the standard of care nationwide, and programs of this type are still a rarity. The numbers demonstrate the effectiveness of the UF Health program, in which 7 in 10 people choose home dialysis. The goal of the UF Health education program is to help patients sort through facts without pressuring them to opt for a particular type of dialysis, Shukla said. The hope is to get patients to the point where they can make an informed choice. If they feel more comfortable with in-center dialysis after hearing an explanation of all options, that’s fine, too, said Shukla, an associate professor in the UF College of Medicine’s division of nephrology, hypertension and renal transplantation. Part of the job is confronting the myths that surround dialysis and showing that while it should be respected, it is not intimidating. For some patients, the first surprise is that there are different types of dialysis. When people typically think of dialysis, they usually envision hemodialysis. This method involves circulating a patient’s blood, accessed via the arm, through a machine with an “artificial kidney” filter that cleanses it of waste products, removes excess fluid and balances electrolytes. That filter, called a dialyzer, has two parts, one for the blood and the second for a special fluid that extracts the toxins. A porous membrane separates the two, allowing the fluid to extract the toxins without mixing with the blood. In the second form of dialysis, called peritoneal, the human body itself is used as a filter to detoxify blood. Teri Booth Martinez, a physician’s assistant at the Chronic Kidney Disease Education Clinic at UF Health, addresses patients and family members during a clinic education session. A surgeon places a permanent hollow tube, or catheter, into a patient’s abdominal cavity. During peritoneal dialysis, a cleansing fluid flows through the tube into the peritoneal cavity within the abdomen. The cavity is surrounded by a thin membrane. The solution, which contains a type of sugar, draws out waste and extra fluid from the blood vessels that line this peritoneal membrane. Both hemodialysis and peritoneal dialysis can be done at home, but it is peritoneal that offers most patients the easier road. Peritoneal dialysis can be as simple as sleeping, Shukla said, with the dialysis machine circulating the fluid in and out of the body during the night. Not every patient can use peritoneal dialysis. For example, some patients do not have a functioning peritoneal membrane because of abdominal surgery. The challenge is getting the word to patients. Patients cannot choose something they don’t know exists. To understand why so few people receive dialysis at home, it is important to recognize how patients with end-stage kidney disease often end up on dialysis. They come to it suddenly and very often in emergency or near-emergency situations, their blood choked with waste products that would eventually kill them without intervention, said Shukla. The program allows patients to safely administer dialysis to themselves at home. Studies have shown that more than half have had no kidney care at all, or they have only seen a nephrologist in the six months before going on dialysis, he said. That means when their kidney function reached crisis, nobody had explained to many of them even the rudiments of dialysis. Once the crisis arrives, physicians often do not have the time to explain different dialysis options. 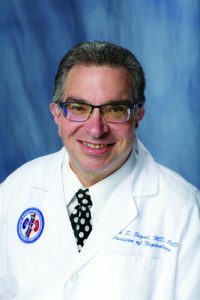 Segal, the UF Health nephology chief, noted that it is much easier for a medical center to send a patient out to a dialysis center since many hospitals are not set up to provide comprehensive renal education. UF Health recognized a solution was required about six years ago, when Shukla launched the dialysis educational program, modeling it after a successful clinic he had previously created at the University of Arkansas. Those who select home dialysis, Shukla said, seldom regret the choice. A 2009 study in the journal Clinical Therapeutics said Medicare could save $1.1 billion over five years if the share of peritoneal dialysis increased to 15 percent. The same study estimated savings of as much as $18,937 annually per patient who switches from hemodialysis to peritoneal. The goal, Shukla said, is still to get patients on a kidney transplant list so that they do not spend the rest of their lives on dialysis. But the reality, he said, is that the wait for a transplant for someone without a donor can reach several years. Shukla has heard all the excuses about why patients think they can’t do dialysis at home. “‘I’m not a doctor. I’m not a nurse. So, I don’t know how to do this,’” Shukla recounted. “That is the most common comment. Studies have shown, however, little difference in infection rates or other complications between the different types of dialysis, Shukla said. “The most-important factor about choosing a dialysis modality is an understanding of what best suits your lifestyle because, based on just medical efficacy, they are all equally effective,” Shukla said. collaborates with UF Health in the educational program. Patients meet one-on-one with Shukla in a session geared more for their personal medical needs. And if a patient later decides to do home dialysis, extensive follow-up training is conducted to ensure they know how to connect themselves to the dialysis machine and successfully cleanse their blood. Nurses visit patients’ homes to ensure they have the room for the dialysis machine and supplies and to be sure no other impediments exist. Patients aren’t allowed to take dialysis on their own until they are absolutely confident in the process, Shukla said. Also, patients must have a partner who can help them. in-center or in-hospital dialysis. Wash hands. Close windows. Turn off the fan. Forget a step? Start over. After living with kidney disease for 20 years, Anthony Thomas of Gainesville finally reached the point that he would have to go on dialysis. That was frightening to the delivery truck driver because he thought that being tied to a dialysis machine three times a week would be the end of his job. When he learned of peritoneal dialysis, he jumped at the chance. “Home dialysis was a no-brainer,” he said. 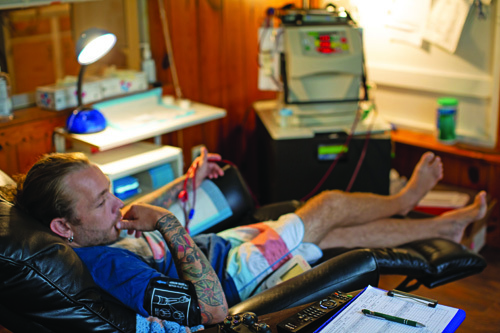 Like almost everyone who enters the UF Health program, Thomas worried he could never develop the expertise to operate the home dialysis machine, which is about the size of a microwave oven. After a couple days of training under the eyes of Shukla and others at the clinic in the spring of 2018, he and his “dialysis buddy” — his wife, Patricia — found it was simpler than they thought. 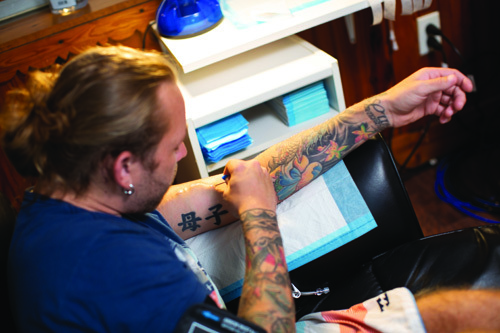 Thomas said his biggest concern was not missing any steps as he connected and then disconnected himself to the machine. He worried about infection. Ashutosh Shukla, M.D., program director of the Chronic Kidney Disease Education Clinic at UF Health, explains the dialysis process to patient Anthony Thomas. It changed Josephine Freeman’s life. She entered end-stage kidney disease in 2015 so weakened, it was difficult to walk. Confidence in herself replaced fear. Now she awaits a kidney transplant. “Home dialysis will help me get there,” she said.